A lot of people, myself included, have felt conflicted about the choice between doing direct work (like health interventions) and trying to change systems. Everyone agrees that well-done policy work can have big impacts, but there's less agreement about how to tell if your work is actually good at changing policy. At the EA Global conference in California, I was excited to hear more about three EA organizations doing policy work, two of which I hadn't heard of before. Video of all the talks. The Open Philanthropy Project, formerly known as GiveWell Labs, is a joint project of Good Ventures and GiveWell. While GiveWell focuses on recommending giving opportunities with very demonstrated impact, the Open Philanthropy Project explores giving opportunities that have higher risks but higher potential rewards, or that may take a long time to have results. You can see Howie Lempel's EA Global talk. At this point they're not asking for more funding and do not expect to recommend specific giving opportunities for individual donors. Effective Altruism Policy Analytics is a really interesting shoestring operation run by students at the University of Maryland and economist Richard Bruns. Its goal is "to bring non-partisan, cause-neutral improvements to regulatory action in the United States." This is definitely in the "experimental" category, but I like it. It's in everyone's interest to have a bunch of slightly better policies, but it's not enough in anyone's interest to do this kind of work for selfish reasons. In other words, it's a perfect project for altruists. Because they just started, they've only heard back about one of their suggested changes (their suggestion was not taken). They're moving toward choosing regulations more carefully and putting more time into each comment, but they expect that the benefit of even one successful regulation improvement would be worth a lot of failed attempts. Here's an example of a case where a regulation was changed based on comments. You can see Matt Gentzel's EA Global talk. They're not asking for donations at this point. The Center for Global Development (CGD) is a "think and do" tank founded in 2001 with the goal of reducing global poverty and inequality via policy change in the US and other rich countries. They work on a broad range of topics including aid effectiveness, climate change, education, globalization, health, migration, and trade. "Cash on Delivery Aid": proposed a program, currently being piloted by the UK Department for International Development, in which the Ethiopian government is paid a set amount for each student beyond a baseline that completes primary school and takes a grade-10 test. Rather than focusing on "was the money disbursed?" or "how many schools/textbooks/etc. did we buy?" as many aid programs do, this puts the emphasis on results. It respects local autonomy, because the Ethiopian government is free to change its educational system in whatever way it finds best. Results seem to be mixed. Popularized advance market commitments for developing vaccines, in which donors make a contract to pay for a successful vaccine if it is developed, providing pharmaceutical companies with financial incentive to develop vaccines. The major success here seems to have been the 2010 pneumonococcal vaccine. After Haiti's 2010 earthquake, one of many voices advocating for increased number of Haitian guestworkers to be admitted to the US. Remittances (money sent home) make up 20% of Haiti's GDP. It's a lot harder for me to tell what's going on here, since it's a much more established organization with a lot more projects than the above two. Because they've tried more things, they have some failures as well as successes on their record. As with much policy work, it's hard to tell how much success to credit to any one organization. E.g. if they're one of several actors calling for a particular change that is made, would it have happened anyway without them? You can see Rajesh Mirchandani's EA Global talk (though it is more about policy change in general than the organization in particular). Unlike the other two organizations described, CDG is actively taking donations. GiveWell has recommended a grant to them in the past. Greetings from the Effective Altruism Global Conference in California! 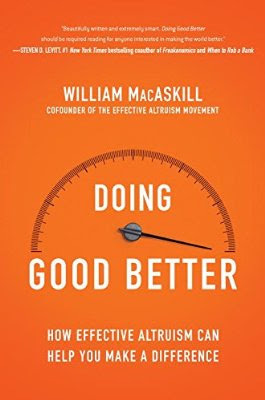 I just got a copy of Will MacAskill's new book about effective altruism, Doing Good Better. I haven't finished it yet, but I'm finding it enjoyable, with sound advice on career choice, what kinds of causes can do most with your donation, and other steps you can take. You should get a copy! Even if you're already persuaded of everything Will has to say, the examples and the ways he lays out arguments may be helpful in thinking about how to present these ideas to others. More thoughts about the conference coming soon.